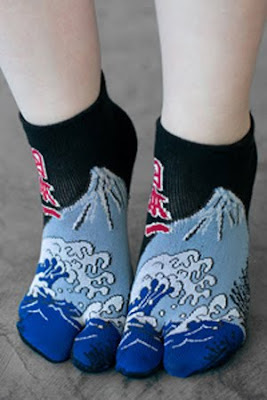 When our buddy Dave sent us these Hokusai-print socks (pictured above) via Fashionably Geek, I got crazy excited. Immediately, I was like, “I want In the Hollow of a wave off the coast of Kanagawa on my tootsies!” Why? FRACTALS! Perfect fractal geometry as presented in art, right on my feet! Who wouldn’t want that (mathletes, c’mon, you’re with me here)?? Then I took a closer look at the landscape. That’s not the coast of Kanagawa. Then a closer look at the waves. Those aren’t fractals. So hunh. They’re just doodley Hokusai-print socks. I guess that’s still cool. Or not cool at all. Totally fract up.